Bundles of Fun for Everyone! Gather together with friends and family to celebrate the holidays with unique and exciting projects. Have fun making delicate and beautiful holiday ornaments! 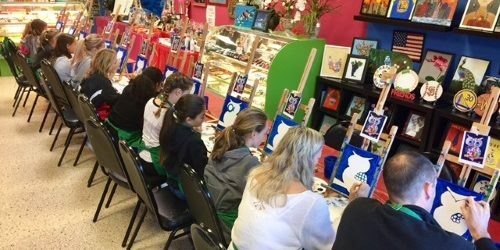 Celebrate your holiday parties at color bundles, paint with your friends! Decorate clay haunted houses or fresh pumpkins for Halloween. Create a decorative pumpkin centerpiece for Thanksgiving. Decorate clay Dreidels with colorful clay, beads, pearls & glitters for Hanukkah. Decorate clay ornaments, clay gingerbread houses for Christmas. If you celebrate a holiday you don’t see here, just give us a call and our designers will create one for you. For more information regarding the projects’ list and prices, please click here . Contact us to book a session. Advanced reservation is required for all holiday classes. Like us on Facebook.com/colorbundles to follow our events & classes.